Demand for housing far outstrips supply, but local regulations and the high cost of construction limit the production of new housing. What few people realize, however, is that half a million homes could be added to our housing supply without laying one new brick. Revising zoning regulations to legalize two-family homes and other accessory dwelling units, incentivizing the subdivision of overly large housing units, and encouraging the year-round use of units could make a significant dent in the region’s housing crisis at low cost. The region faces a severe housing shortage, yet many communities continue to oppose the creation of new homes. Even simple measures to allow more people to live in the housing structures that already exist can be unpopular. 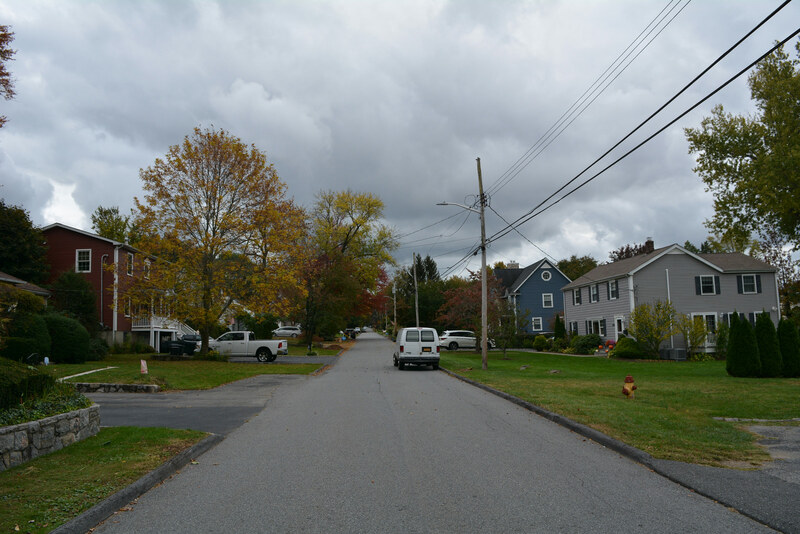 Zoning codes prevent single-family homes—even large ones—to be converted to two- or three-family homes. Spaces above garages, on ground floors, or in attics of houses could be converted to small apartments—for an elderly parent, a care provider, or a renter—but that is not allowed. Regulations also fail to encourage vacant apartments from being rented in urban neighborhoods. In Manhattan, where demand for housing is the highest, many homes go unoccupied most of the year as their owners have primary residences elsewhere. The region needs to create more than two million homes over the next 25 years to relieve our housing shortage and accommodate new residents. Yet we do not allow new homes to be created, even when they don’t require new construction. Regulations should be revised to allow more homes to be created in each housing structure, particularly in single family homes. New incentives can be used to discourage using real estate as investment vehicles and leaving apartments empty in the midst of a severe housing shortage. With these changes in place, there is potential to house more than a million new residents without building a single new house or apartment. What’s more, these new homes could provide some diversity to the housing mix—creating housing that is more affordable in otherwise expensive communities. They could also be helpful in providing a convenient place to live for the growing elderly population who want to stay near family, and to low-income families and young adults looking to be first-time home buyers. Zoning should be reformed such that every single-family dwelling is allowed a second dwelling unit if it meets appropriate fire and building codes. Other accessory dwelling units should be allowed by reforming rules related to light, air, relation to ground level, and other laws and regulations that do not affect safety, while retaining strict safety and housing quality measures appropriate for modern life. Approximately 100,000 new homes could be added in New York City alone by instituting these reforms, and potentially up to 300,000 throughout the region. Allowing single-family houses to have second dwellings would greatly help our housing shortage. If 10% of single- and two-family houses had another dwelling, it would add over 300,000 homes across the region, including in places with significant housing shortages like Long Island. Source: Calculated as 10% of single family homes and duplexes who have potential to add another housing unit. U.S. Census American Community Survey 2015, 5 year estimates. 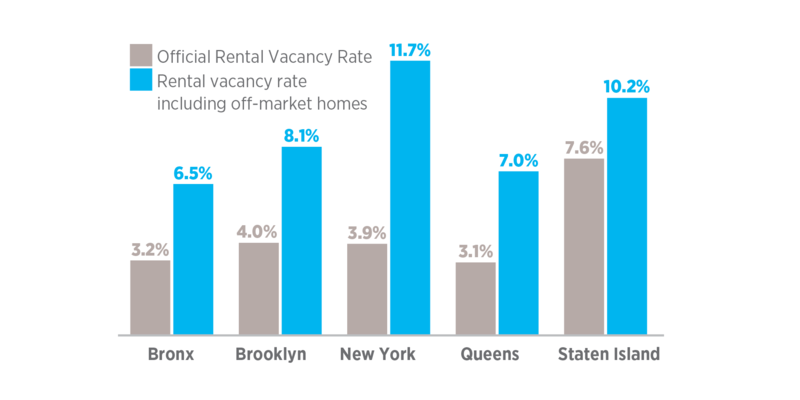 More than 60,000 apartments in New York City alone are vacant but not on the housing market, because they are second homes, pied-a-terres, or used for short-term rentals. The more of these units that are put back on the market, the more it will help our housing crunch, especially in Manhattan. Source: U.S. Census American Community Survey 5 Year Estimates, 2015. In counties with rental vacancy rates under 5 percent—where there is a housing emergency—a property tax surcharge should be implemented on all residences that are not a primary residence of a household paying local income tax, in order to incentivize primary use of housing. In these counties alone, there are approximately 125,000 houses or apartments that are vacant and habitable, but kept off the market for occasional use as pied-a-terres or second homes. (About half of those are in New York City and half in other counties.) Another 140,000 units are habitable but kept off the market for other reasons. If just half of all these empty units were put back on the market, it would add as much new housing as is built in two years regionwide. Multifamily housing is most needed in areas within walking distance of mass transit in the urban core. Yet we have over six square miles of land near transit where zoning rules only allow single-family homes. These regulations should be changed to allow for multifamily housing in both new and existing homes. Homes in these districts in excess of 2,500 square feet should also be treated as more than one unit for property tax purposes (e.g., a 10,000 square-foot home should be treated as four 2,500 square-foot homes). Building codes could also require large units to install kitchen and bathroom fixtures as if they were several smaller units, to enable easier subdivision when market conditions allow. Co-op- and condo-law reform should also be explored in order to legalize and ease conversions to several smaller apartments. Reforms to building codes to allow smaller units and co-housing situations should continue and be expanded. Short-term letting, meaning renting or subletting out apartments for short periods of time generally utilizing platforms such as Airbnb, should be regulated with a policy of one apartment allowed per host, which would have to be at an address where the host has their primary residence and pays local income tax (if applicable). This would include two- and three-family homes, where a landlord would not be allowed to rent out units that are not their primary residence on a short-term basis. In addition, the amount of time people can rent out apartments should be limited. These reforms would have the effect of largely limiting short-term rentals to times when an apartment would have otherwise been vacant, as opposed to taking potential permanent housing off the market for the sole purpose of generating income through hotel-like short-term rentals. More specific rules should be established for public housing, other subsidized housing, rent-stabilized apartments, and cooperative and condominium housing. New York City, in conjunction with either the region or other large destination cities, could also explore establishing its own platform to more efficiently regulate short-term letting, and lower costs for hosts. Hidden housing can make more homes available at little cost, provide income for homeowners, and allow residents to stay in their communities. Approximately 500,000 homes could be added to the housing inventory without any additional major construction. These homes would likely be more affordable than newly built housing. For the most part, accessory dwellings are less expensive than main housing units, and smaller units are less expensive than larger units. 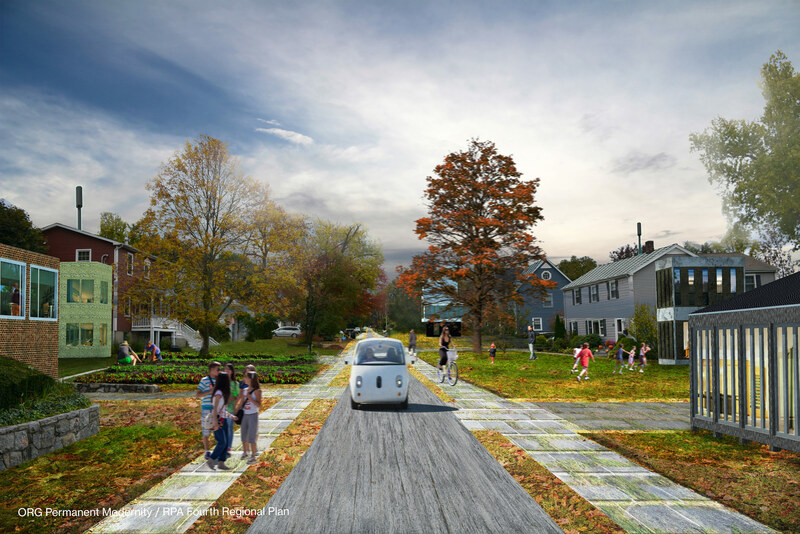 In addition, many of these homes would be produced in desirable, walkable urban areas that have good urban infrastructure and few opportunities for newly constructed affordable housing. Both pied-à-terre units converted to permanent housing and units used for short-term rentals converted to residential usage are likely to be in denser, more desirable urban areas. These policies would increase tax revenues with few direct public costs. Allowing accessory dwelling units would have a cost of added regulation and enforcement, but increased property tax revenue from the additional value they provide would more than offset this cost. A tax on non-primary residences would generate revenue for the city. Reforms to disincentivize overly large units in favor of smaller units would also allow for more property tax revenue. Reforming short-term letting would have a cost on existing owner/renters who benefit from the practice, as well as a small municipal cost in added enforcement. All of these policies would allow for more densification of areas with existing infrastructure, which lowers costs of infrastructure improvements overall throughout the region. There would, however, need to be targeted infrastructure investment in the areas that would add a large amount of population through these reforms.